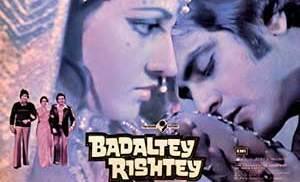 Badalte Rishtey is a 1978 Hindi movie directed by Raghunath Jhalani.The film stars Rishi Kapoor, Jeetendra, Reena Roy, Asrani and A. K. Hangal.The films music is by Laxmikant Pyarelal.Overall this movie is really a good one, Jeetendra and Reena Roy acted well, so as Asrani and other Supporting cast.But the show stealer is Rishi Kapoor.Music is superb too.Go for it, as it is one of the good movie of mid-70’s released on 11th March. Manohar (Rishi Kapoor) though an orphan is full of life and being a brilliant student still earns while he learns.His pranks amuse Savitri (Reena Roy) who also earns her living by teaching music to Prema (Rachna Bhatt), Sagar (Jeetendra) sister.Savitri takes liking for Manohar, while in Sagar heart of hearts, these is only one image and that is the one of Savitri-Savitri mother favours this match which Savitri clearly rejects.Savitri is disturbed and approaches Manohar disclosing to him about her mother wishes. Manohar assured her that he will persuade Colonel Saheb (Pinchoo Kapoor), his God father to approach Savitri mother and arrange a dialogue to discuss the bethrotal.In this gay mood, he sings and skiis down the snow-clad peaks, but suddenly slips and meets with an accident-he is unconcious with serious head injuries.Champa (Shashi Bala) Savitri friend warns her that her father Professor (Hangal) has predicted that Manohar will die within forty days of their marriage.He has also predicted the serious paralytic stroke her mother would suffer.The family doctor cautions Savitri brother Anup (Asrani) and requests them to accede to the wishes of the mother and marry Sagar in order to save her life. Savitri reluctantly submits and the marriage is being solomnised, but then champa gives out the truth to Savitri that according to the prediction her first husband will die within forty days of her marriage and she is destined to become widow.Manohar is lying unconscious in the hospital.Savitri is married to Sagar.What had destiny in store for the future of these three innocent souls-trapped in the TRIANGLE OF “BADALTEY RISHTEY”.